I was so excited to hear from Eva, one of my favorite brides from 2009. She contacted me to do her moving announcements for her. She was amazing to work with in the past and now I was looking forward to working with her again. One thing that I love about Eva is she doesn't hesitate to ask even if it's something not on my website. These moving announcements were a first for me. She was torn between a key or bird theme and she chose the birds, going with the nesting theme. 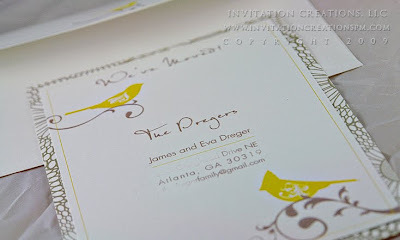 These had a more modern edge to them than her wedding invitations and we used a grey-brown and yellow color combination. Thanks, Eva for trusting me once again. You're awesome!